Meijer is a Grand Rapids, Michigan-based retailer that operates over 210 supercenters and grocery stores throughout Michigan, Ohio, Indiana, Illinois, Kentucky, and Wisconsin. Today, no one operates on the same schedule, so our stores and gas stations are open 24 hours a day, 364 days a year! As a pioneer of the "one-stop shopping" concept, Meijer stores have evolved through the years to include expanded fresh produce and meat departments, as well as pharmacies, comprehensive electronics departments, garden centers and apparel offerings. Their expansive supply of products makes Meijer the ideal candidate for gift cards and egift cards. Employees will love receiving this as a holiday gift, or for recognition and rewards programs! Family-centered and family owned since 1934, we’re proud to be a part of the local communities we serve. We provide positive solutions to everyday problems. For example, we understand prescription costs can be something that many struggle with. We have developed programs to deal with just that. Our customers can now get select free antibiotics and prenatal vitamins with our prescription program. The hallmark of the Meijer hunger relief efforts is its Simply Give program, which has helped neighborhood food pantries keep their shelves stocked for more than 5 years. Since 2008, this signature program has generated more than $9 million, thanks to the continued generosity and support of Meijer customers, team members, and food pantry partners who are committed to helping feed hungry families. Additionally, last year, the Meijer food rescue program donated 5.4 million pounds or 4.5 million meals to help local food banks. National Gift Card is the best place for you to order Meijer gift cards and egift cards in bulk. We are the experts in all things gift cards and can set up your gift card solutions program for you today. Please contact us for more information on Meijer bulk, direct-to-recipient, or individual gift card fulfillment for your gift card program. Contact us here or call us at 888-472-8747 today! “Meijer” and the Meijer logo are used with permission of Meijer and such marks constitute registered trademarks or service marks of Meijer. Meijer is not affiliated with National Gift Card and is not a sponsor or co-sponsor of this program. 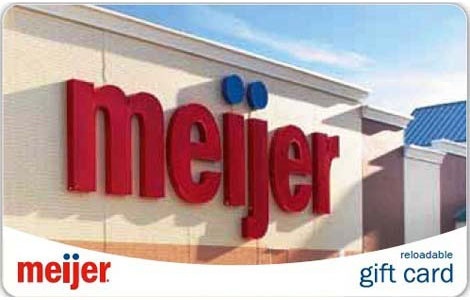 Meijer agrees that National Gift Card may use the Meijer name, logo, trade names and trademarks in connection with the program. Meijer is not liable for delivery of any gift cards promised, earned, purchased or otherwise offered through this program. Please see the Meijer gift card for additional terms and conditions, which are subject to change at the sole discretion of Meijer.